Linda Keller&apos;s poems swirl with sensation, memory, humor and a compelling love of nature. Her clear, direct style makes it easy to connect to her writing, reaching even those readers who traditionally do not chose poetry. 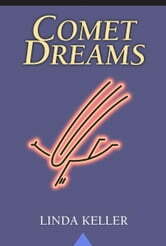 Comet Dreams includes forty two of Keller&apos;s poems. The book is illustrated by 12 full-color images by John Boak, landscapes in colored pencil and oil paint. Theresa M. Sull M. Ph.D.